The little plastic straws that come with juice boxes cause a lot of waste – both in the manufacturing process and after they’ve been used once. While the most beneficial answer would be stopping the manufacture of single-serving drink packs altogether, that’s not a realistic immediate goal. 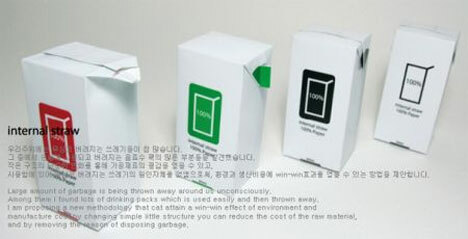 Designer Kyung-soo Park came up with this concept to at least cut down on the trash produced by juice boxes: the Internal Straw. 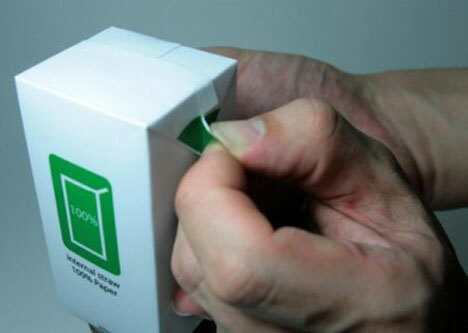 Instead of an attached plastic straw, the design features an extra fold of cardboard at the seam of the carton which becomes a straw when folded out and the end snipped off. The concept isn’t a radical redesign, and it’s one that would be simple to implement. 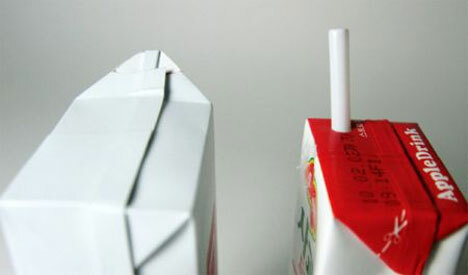 The “straw” is actually not much more than an unfolded corner of the existing juice box design, but it would drastically cut down on the amount of plastics used in the manufacturing process. It could be the next best thing to using reusable containers for carting your drinks around. See more in Industrial Design or under Technology. June, 2010.